This video takes a deep dive on how to create a Social Portal for Exceptional Web Experiences. 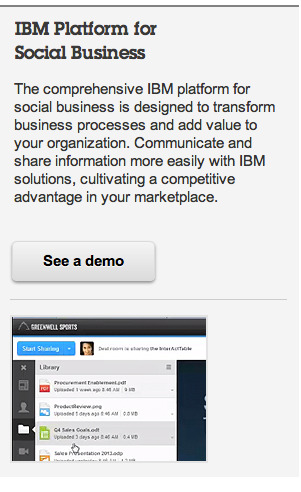 The social layer is provided by IBM Connections and using the new social rendering portlets you can create a great and compelling experience with a few clicks and, most importantly, with no coding skills required. This is very useful when you want to open up Connections to users outside of the organization and/or you want to socialize an existing web front. All of these capabilities are available today so there's no need to wait! Update on 27/Mar/2013: I've embedded part 2 of the series and thanks to Ken Krause for doing this!! At the webcast we had Ray Wang, from Constellation Research, kick things off by talking about the 9 C's of collaboration. Building on the launch of IBM Connections 4.5 and IBM Notes 9.0, the demos that were done during the IBM Connect 2013 keynote (aka OGS) (aka Opening General Session) are now available directly from the main IBM.com/social page. From that page, there's a demo tab which then brings you to a page with individual product demos as well as the OGS demos from IBM Connect 2013. 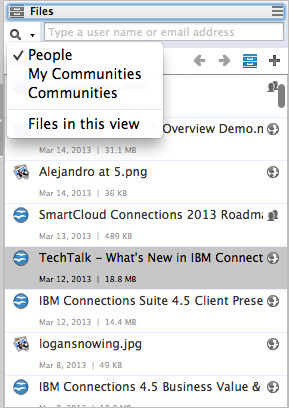 As a reminder, IBM Connections 4.5 will be available on March 29th, 2013, so get ready! IBM Connections Coders: Get Ready for the Appathon ! The past several blog posts have been about cool new apps built for IBM Connections and how they were announced at IBM Connect. Needless to say, I'm extremely happy with how the IBM Connections ecosystem has grown and I want to keep growing it! To that end, at IBM Connect I talked about the Appathon which has just started. In case you missed it, I wanted to make sure you were aware. For this contest, the IBM Connections category will have five $1000 prizes and the deadline for submission is June 23, 2013 so there's plenty of time to get started ! If you haven't done any app dev work for IBM Connections, I would like to suggest 2 steps to get started. Now, get coding and good luck!